The Hot Rods were undefeated this past week, finishing the week riding a six game winning streak. With the first half of the season nearing an end, the Hot Rods reduced their magic number to clinch a playoff spot to four games. The Hot Rods are 37-28 on the season and sit just a ½ game back from the leader. 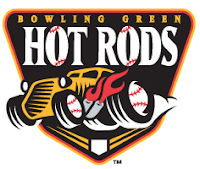 The Hot Rods will send a team record four players to Tuesday’s All-Star game with Derek Diertrich, CJ Riefenhauser, Eliazer Suero and Phil Wunderlich making the trip to Quad Cities. Disabled List: Jairo De La Rosa, Will Kline and Wilking Rodriguez. The Week Ahead: 6/15/11-6/16/11: vs West Michigan White Caps. 6/17/11-6/19/11: at South Bend Silver Hawks. 6/20/11: No Game: All-Star Break. 6/21/11: Midwest League All-Star Game.